Here is an updated version of the Script Debugger 6 (build 6A162) release notes. 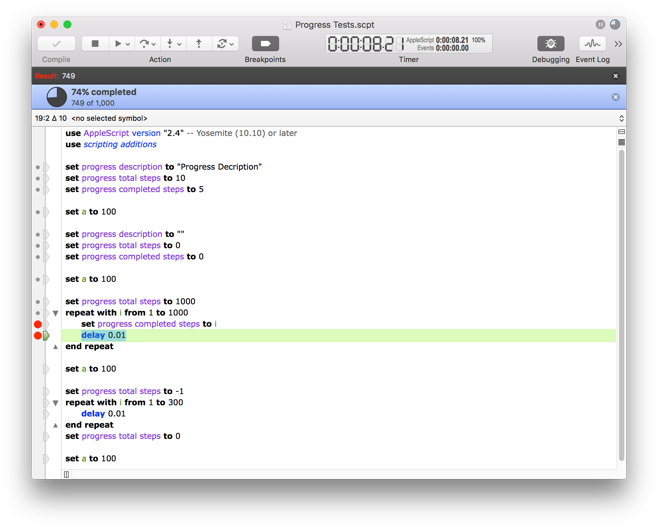 We are very close to completion and this document quite accurately reflects the new features in Script Debugger 6. 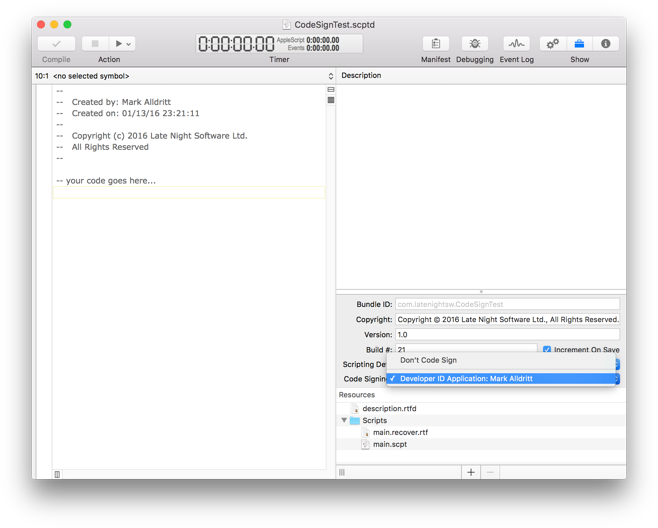 You are able to specify a default copyright string which is used when creating new bundled scripts and applications. This default copyright string may contain clipping directives which are expanded at the time a new script document is created. 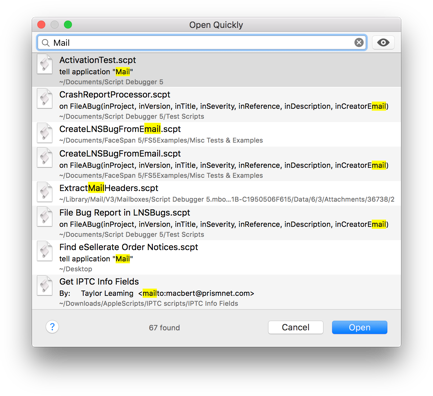 The Open Quickly command, which allows you to easily search for and open scripts containing a particular term in the name or the body of the script, has been heavily revised for Script Debugger 6. 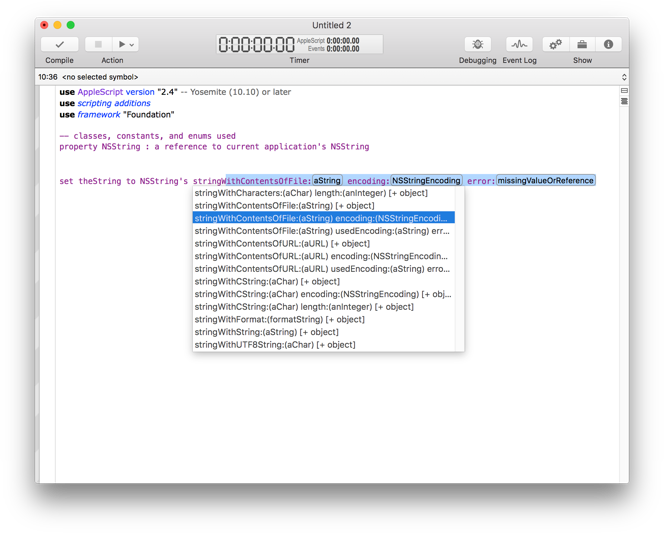 Script Debugger 6 at long last provides code folding where you can collapse block structures and comments within your code to reduce clutter when editing. 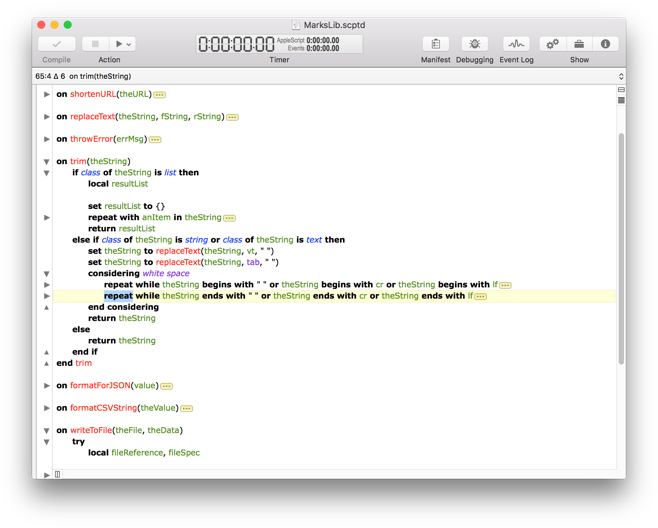 Improved code completion to include all matching user defined identifiers, commands from target applications and AppleScript Objective-C identifiers. 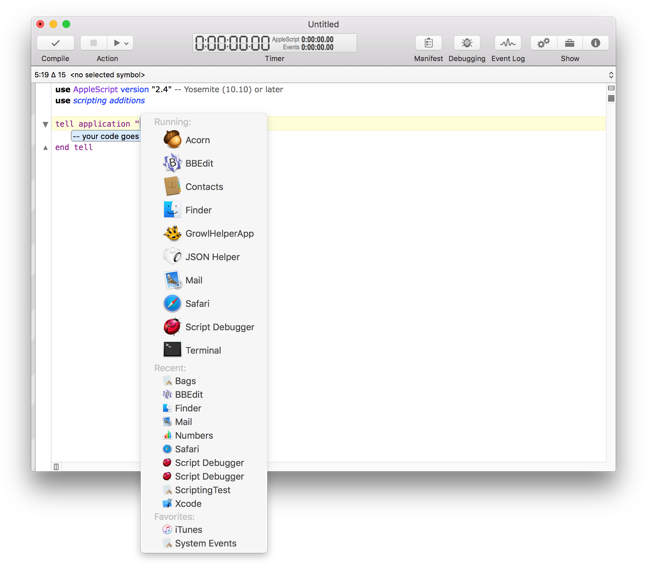 AppleScriptObjC code completion covers the main Cocoa frameworks, and automatically handles insertion of current application's where required. The insertion can be either in-line, or in the form of automatically generated properties, with the ability to refactor between the two forms. Breakpoints, which allow you mark specific lines of your script where execution will pause in debugging mode, can now be moved by dragging them within the script’s gutter. Additionally, you can delete a breakpoint by dragging it out of the script’s gutter. 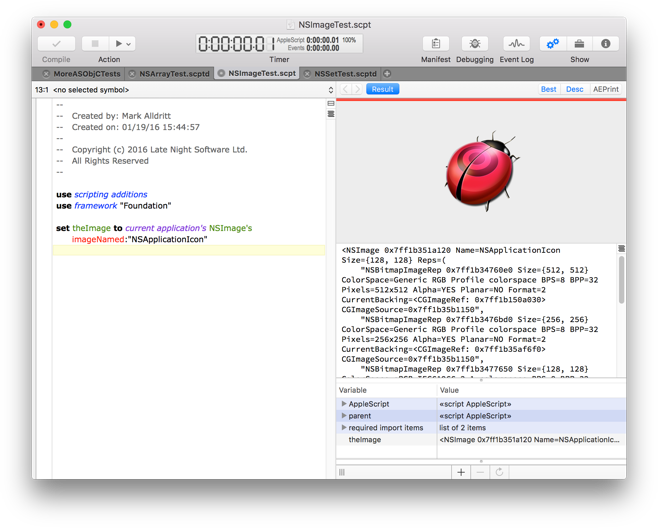 Script Debugger 6 supports Mac OS X 10.10 (Yosemite) or later and Mac OS X 10.11 (El Capitan) is recommended. 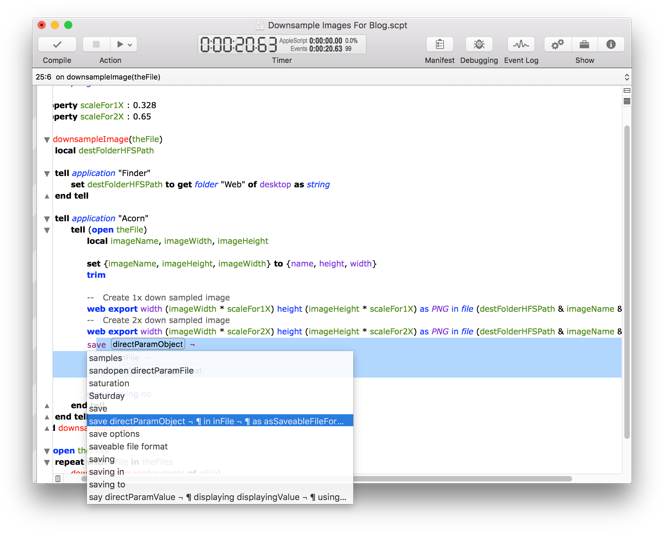 Script Debugger 5’s library inclusion mechanism is no longer supported in Script Debugger 6. 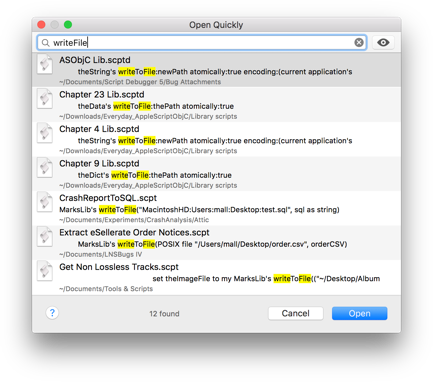 This means that Script Debugger 5’s Libraries pane has been removed along with the Flatten Script command found in the Export submenu of the File menu. 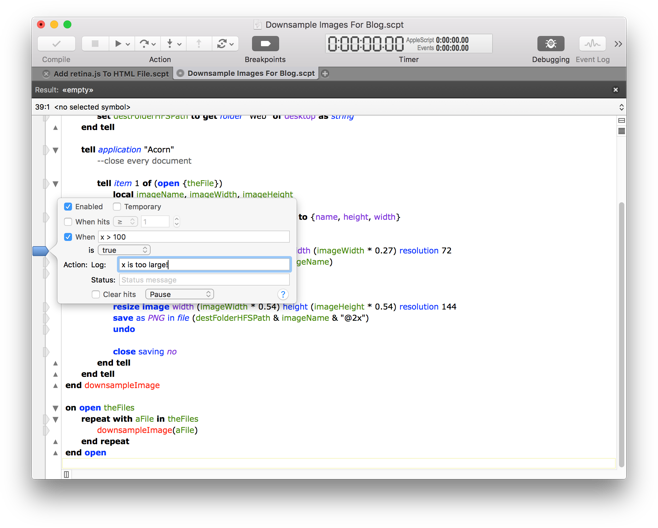 Script Debugger 6 provides a conversion service that translates Script Debugger 5 references into AppleScript use script statments.